Can anyone offer one serious, credible reason why I should consider a belief in your god? I’m not asking for empirical evidence. Just one credible reason we should discuss this further. Even though the OP had a vanishing chance of changing his mind about anything because of this question, I found a certain elegance and importance to how it was posed. So much conversation about beliefs hinges on whether this particular piece of evidence or line of argument is convincing or not convincing, but only rarely do you ask why you should be taking up the case in the court of your mind in the first place. And it’s an important question. The vast majority of our lives, we don’t make significant changes to our mindset, thought processes, worldview. We might pick up a habit from a friend, find the wisdom in our parents’ advice, or learn another useful lifehack from Buzzfeed here and there. But it’s only in rare moments that we take a moment to step back and reexamine whether we want to entertain a much more dramatic shift. Let me try to analyze this in a different light. If you’re already well-versed in thermodynamics, you can probably skim/skip this section. In the vertical axis, we have the potential energy, where lower energies are more favorable, like gravity. 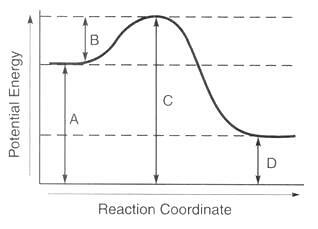 In the horizontal axis, we have this generic “reaction coordinate” which is rarely precisely defined but often means the change in some angle or bond length. Anyways, another thing chemists learn is that if a reaction can go in one direction, it nearly always can and does go in the other direction as well. So if this diagram was level, if the reactants had the exact same amount of stored energy as the products (A = D), then the reaction would even proceed in reverse as well until the two sides are equally balanced. In fact, left alone, this reaction will always eventually equilibrate to a certain ratio of products to reactants, depending only on the energy gap A – D and the temperature. The larger that gap, and the colder the temperature, the higher percentage of products will be produced. But this only happens eventually. If the activation energy is high enough, it might take way too long for it to matter for all practical purposes. But if it’s low enough, they’ll quickly reach the proper equilibrium concentrations. Chemists distinguish these two cases by saying that the former are under kinetic control and the latter are on thermodynamic control, by which consideration determines the concentrations on a timescale we care about. Finally, a good catalyst speeds up the reaction by lowering the activation barrier, often with the purpose of switching a reaction that used to be under kinetic control to being under thermodynamic control. Another way to make this switch is to heat up the compounds (assuming that won’t cause a different reaction), because extra heat provides additional energy that could be used to cross the barrier. But increasing the temperature also makes the less energetically favorable alternatives comparably more attractive, so it changes what the equilibrium distribution is. I think many of you can see where this is going by now. Religious conversion is also a reaction, and the same principles apply. There’s an activation barrier, from both intellectual and social concerns, to considering converting one way or another that you have to surmount in order to change your mind. There’s also often a thermodynamic gap that steadily pulls people in one direction or the other over time. You don’t get a lot of people converting to Norse mythology these days, because it really doesn’t have a lot going for it. A good example of a catalyst in this context is the internet. The accessibility of information dramatically reduces the cost to learning about a new religion, and sometimes new communities even form online. The result is to make people more likely to convert one way or another, probably without shifting the equilibrium. The role of temperature also analogizes. It seems to me that middle and high school years are comparatively hot, formative times, when people are most willing to redefine their worldview. But teenagers’ mood swings tend to more frequently push them into weirder perspectives that aren’t ultimately the best for them, just as how extra heat promotes higher-energy states. By contrast, the older you get, the more you cool down and apart from the flash of a occasional crisis, you tend stick to what you decided to believe when you were younger. It’s a double-edged sword: At cooler temperatures, the conversions tend to go in the same direction, but take a longer time to happen. Often you need a catalyst like cancer or the loss of a loved one to get you to reevaluate your worldview, but having lived longer, you can then see the differences more starkly than when you were a teenager. And the question I want to pose to everyone today is: Is your worldview under kinetic control or thermodynamic control? If you’re under kinetic control, you probably haven’t thought about this much. Maybe you’re like many of my “ignostic” undergrad friends at Caltech: You’d call yourself an agnostic out of ignorance, never really considering the question. Or maybe you’re a sheltered Christian blindly following whatever your parents believe without taking the time to think through it for yourself. If you’re under thermodynamic control, by comparison, you’ve seen it all. You can weigh the advantages and disadvantages of each of the major religions and philosophies, and know where you stand. Maybe you’ve converted yourself from one worldview to another, so you know quite well what both of those options are. Or maybe you haven’t, but at least you’ve checked it out. You’re probably expecting me to say that it’s always better to be under thermodynamic control than kinetic control. After all, it’s always thermodynamics in the long run, and if you’re just going to convert when you get cancer some time in the future, you might as well do it now and start to live in that better frame of mind. But this is only true if the thermodynamic differences are great enough. If there’s really no difference between religions, if they all teach the same truths and lead to the same outcomes, then it doesn’t really matter whether you’ve given them each a shot. Might as well just continue with whatever you already personally believe and encourage everyone to just mind each others’ business. Can anyone offer me a reason I should climb the activation energy to take a good, hard look at your worldview? I’m not asking for you to push me down the hill into that perspective. Just a reason to give myself enough energy to consider converting. I think I’m under thermodynamic control here. I’ve played out in my head what it would look like for me to become an atheist/agnostic. Last year, I was part of the MIT Addir Fellows Program, an interfaith discussion group, meeting weekly to discuss our different faiths. My group included two Mormons, a Hindu, a Jew, a former Muslim, a lapsed Catholic, a well-considered agnostic and one other Christian. Outside of that group, I’ve also had a lot of conversations with friends about what they believe, particularly in college. Christians grow on a personal level, as we recognize our own errors and learn to confront them without taking it personally. We have a loving community all over the world within which we have the freedom to challenge each other to grow. Christianity changes your worldview for the better, making you more selfless and connecting you to a movement bigger than yourself. If those benefits strike you as significant, maybe you should consider switching to thermodynamic control, at least with respect to Christianity. The third virtue is lightness. Let the winds of evidence blow you about as though you are a leaf, with no direction of your own. Beware lest you fight a rearguard retreat against the evidence, grudgingly conceding each foot of ground only when forced, feeling cheated. Surrender to the truth as quickly as you can. Seeing worldviews as hypotheses, therefore, we should strive to reach thermodynamic equilibrium as quickly as possible. This actually has a clear analog in Bayesian reasoning, if we correspond the distributions of reactants and products in chemistry with our individual probability distributions over competing theories. (And both get computed from the partition function, which serves a mathematically identical normalizing role in each, but this is a tangent.) In Bayesian reasoning, the equilibrium corresponds to the distribution best supported by the data, so we’ll be less wrong if we equilibrate as fast as possible. So what’s my call to action? How can you move from kinetic control to thermodynamic control? If you’re a believer in some religion, particularly if you’ve been to college, it’s probably quite possible that you can imagine like I did what irreligious life would be like. Maybe you have other social groups that you’d end up hanging out with more rather than with your fellow believers. You can probably imagine living with approximately the same morals as you currently have without the religion to back them up. And if you’re sheltered enough that this isn’t the case, you probably aren’t reading this in the first place. If you’re not a believer and might consider Christianity, this is also the best week to visit a church in your area! Easter Sunday services often get many newcomers, so you won’t stand out. The message often focuses on the defining moment for the faith, too, so you’ll jump straight to the crux of the issue. And if you’re in the Boston area, I’d like to personally invite you to attend my church’s 11am Easter service with me. One of the reasons I picked City on a Hill when I first moved to Boston was because of how winsome the services were, so a non-Christian visitor would feel welcomed and not excluded. If you’re coming from the MIT area, we can give you a ride to Brookline; just send me an e-mail. First, it sure sounds like you think you’ve reached thermodynamic control already, so my message isn’t directed at you. You took your chance to consider Christianity, and now you stand where you stand, and that’s fine. Second, I’d like to apologize for whatever negative experiences (or simply not that positive experiences) you might have had in churches in the past. The reality in the US is that there is so much religious diversity even within Christianity, that sometimes it can be really awesome but sometimes it can also not be so great. As faithful as I’d like to be, there are churches I would not attend even if they were the only ones in my area. I don’t say this to throw anyone under the bus, but to say that I sympathize with those who’ve had negative experiences in a church. And again, the church I’m part of here in Boston is the best I’ve seen so far. If you don’t live in the Boston area or it isn’t easy for you to get to MIT or Brookline, I’d generally recommend the church planting network that my church is part of, known as Acts 29. I’ve been to three other Acts 29 churches (in Duluth and Boulder, as well as another in Boston) and they were all similarly great. Finally, I find it unfortunate that the “hottest” time in people’s lives is also the time when those they interact with have the least maturity. It’s sad that the impression many people have of Christians is what they got from their Christian high school classmates. Looking back, I was a horrible Christian back in high school, not loving towards my peers who weren’t as smart as me and wrongly obsessed with proving the truth of creationism (more on that in future posts). I’m ashamed that that might be what my high school classmates think Christians are like. Yet one of the redeeming features of Christianity is personal growth, which makes it wrong to judge its effects based on the merits of someone who is only beginning that journey. Even churches mature as well, as I’ve been happy to see happen within my high school church as I’ve gotten to visit a couple times each year. Even if you think you considered Christianity back in high school and rejected it, it probably looks different and better later in life and might merit a reconsideration. So you listed three points as reasons to believe in Christianity: personal growth, community, and a broader worldview. But are those really so unique to Christianity? I imagine people of other religions would claim the same things.